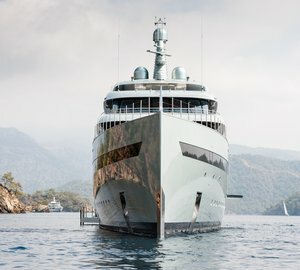 Luxury motor yacht CARPE DIEM, previously known as GIGI, measures 24.38m (80') in length and was launched by the Hatteras shipyard in 2008. 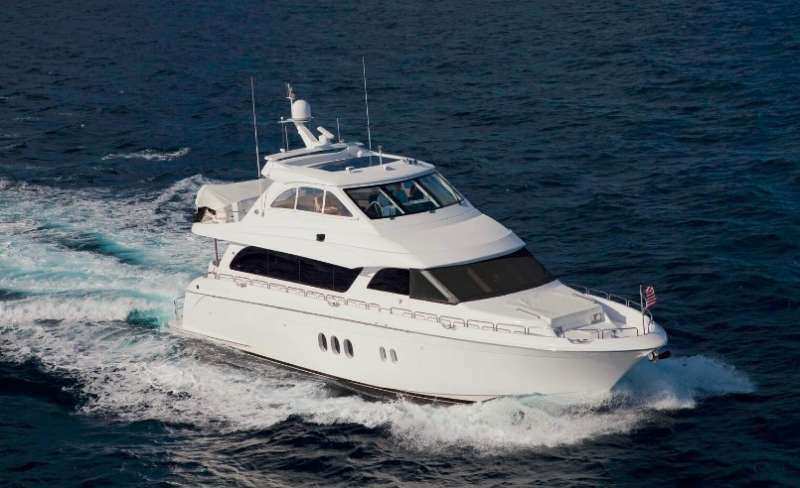 Refitted in 2014, the yacht offers inviting and homely interiors for up to 6 guests, sleeping in 3 deluxe cabins. A crew of three will cater for guests’ every need throughout the entire charter vacation. From the swim platform, guests can access the main deck aft for alfresco dining and outdoor living at the sofa integrated into the stern. 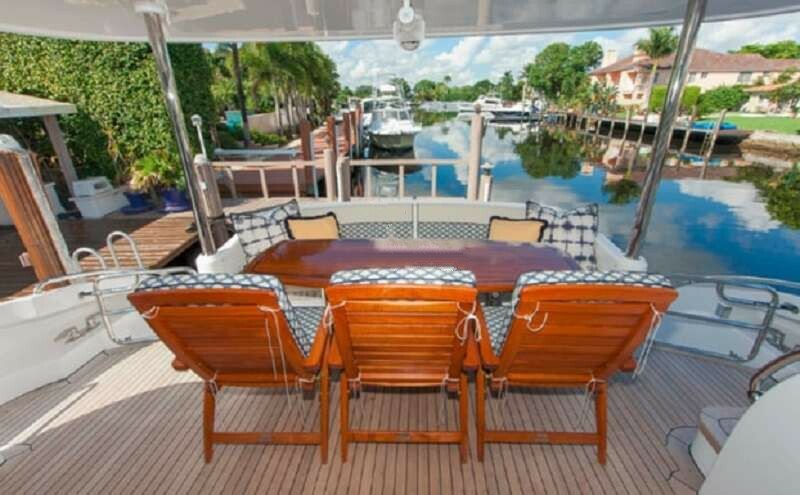 A large raised table and additional chairs offer enough space for a group of six to lounge outside shaded by the flybridge overhang. On the foredeck, the bow is covered with sun pads for resting in the sunshine with uninterrupted forward views. The forward section of the flybridge is covered and guests can access the aft through the doorway or via the stairs. Here, there are two padded seats where guests can relax and take in the surroundings. Two jet skis are stored on the aft that can be launched and retrieved using the Davit crane. When space is clear it can be used as an additional sunbathing area. The classic interiors use mid-tone panelling against furnishings in cream and blue for a calm and relaxing atmosphere throughout the shared and private guest spaces. The lower deck hosts the guest accommodation, which consists of a Master suite, a VIP stateroom and a double cabin all with en-suite facilities. On the main deck, the salon interior places a bar on the starboard side forward and an elegant formal dining table beside the opposite windows for scenic views and natural light for daytime dining. 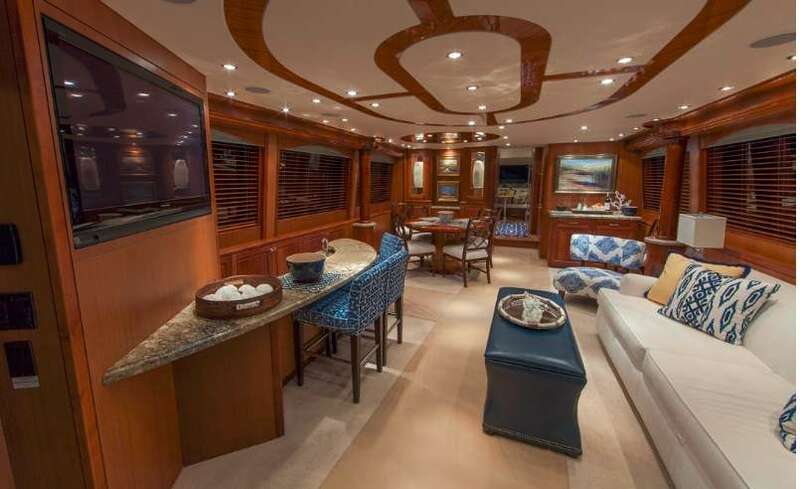 To the aft, a larger wet bar is placed on the port side near the aft sliding doors, and a TV is positioned on the wall above for entertaining guests sitting on the adjacent sofa or armchairs. Forward, the galley provides an alternative interior space where guests can gather for meals and conversation and take in the forward views from the casual dining table or watch TV on the unit in the windowsill. Above, the flybridge gives guests a semi-enclosed space for all-weather relaxation taking in the elevated views. 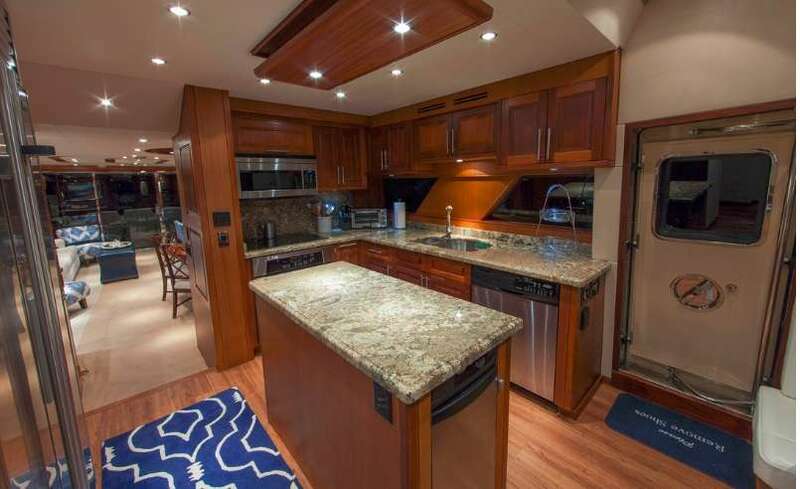 Behind the forward helm station, there is a port-side wet bar and a skylight above that can be opened for fresh air and a greater connection to the surroundings. Both sides have integrated seating that follows all the way around to the stern, leaving enough of a passageway for guests to access the outdoor area. A pair of CAT 32 1700 HP engines installed in 2014 provide a maximum speed of 26 knots and a cruising speed of 21 knots, with a range of 470 nautical miles. Accommodation for up to six charter guests is divided between three deluxe cabins. 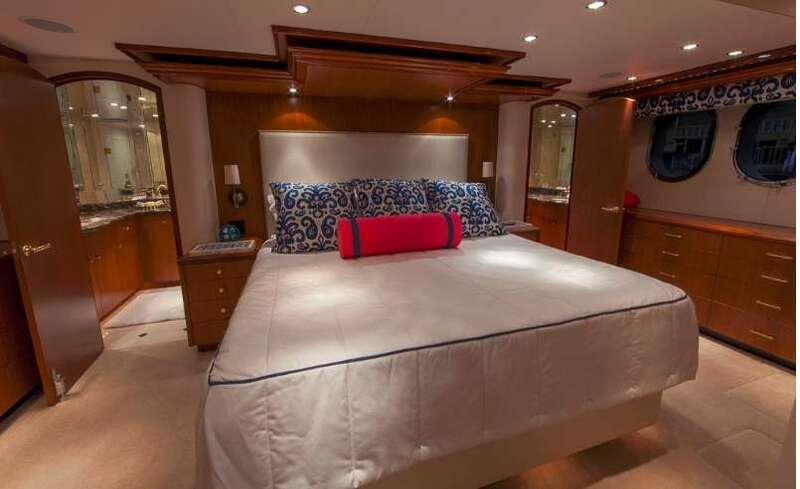 The master suite with a king-sized bed, a cedar-lined wardrobe, TV, DVD/CD player and ensuite bathroom with a shower is placed below decks aft. Amidship is the VIP stateroom with a queen-sized be, cedar wardrobe, TV/DVD player and ensuite bathroom with a shower. While the guest stateroom is located forward and also features a queen-sized bed, cedar-lined wardrobe, TV, DVD/CD player as well as an ensuite bathroom with a shower.